The Changing Of An Era For MotoGP ? Honda’s new “Open Class” production racer the RCV1000R. The final MotoGP of the 2013 season at Valencia brought with it a remarkable conclusion to the championship, with Marc Marquez clinching the title to become the youngest ever MotoGP World Champion and the first “rookie” to do so in 35years. There were, however, a number of other events surrounding the race that also announced the changing of an era. 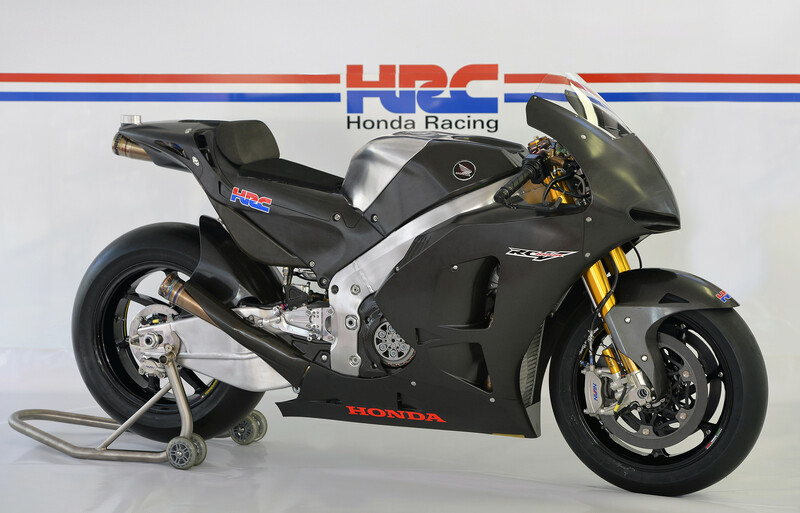 Honda unveiled its RCV1000R “Open Class” racer (formerly CRT), and it is the first production racer to be sold to private teams by Honda since the NSR 500V two-stroke V-twin in 2001. That in itself is a boost for the category, but when HRC revealed that Casey Stoner tested both bikes at Motegi on the same day, on the same tyres, and the difference between the production racer and full factory RC213V was only 0.3s, it shone a spotlight onto what may be the future of MotoGP. More significant though, was the time set on the softer compound rear tyre only available to the ‘open’ class riders, dropping the gap down to just 0.17s! Hiroshi Aoyama on the RCV1000R at the Valencia tests. The production racer is a “toned down” version of the full factory RC213V. The main differences being steel sprung rather than pneumatically operated valves, and a conventional rather than seamless shift gearbox. The 1000cc 90 degree V4 engine will still produce ‘over 175KW’ (235hp) at 16,000rpm with Öhlins suspension and Nissin brakes fitted as standard. The price tag to buy the Honda is believed to be around 1.2million euros. However, an upgrade package for 2015 means that the cost, when spread over two seasons, is likely to be approximately 800,000 euros a year, which is more in keeping with Dorna’s policy on pricing for the newly named category. Four machines so far have been purchased; two earmarked for the Aspar Team to be ridden by 2006 World Champion Nicky Hayden and Hiroshi Aoyama. MotoGP rookie Scott Redding at the Gresini Team and Karel Abraham of the Cardion AB Team will ride the other two machines. 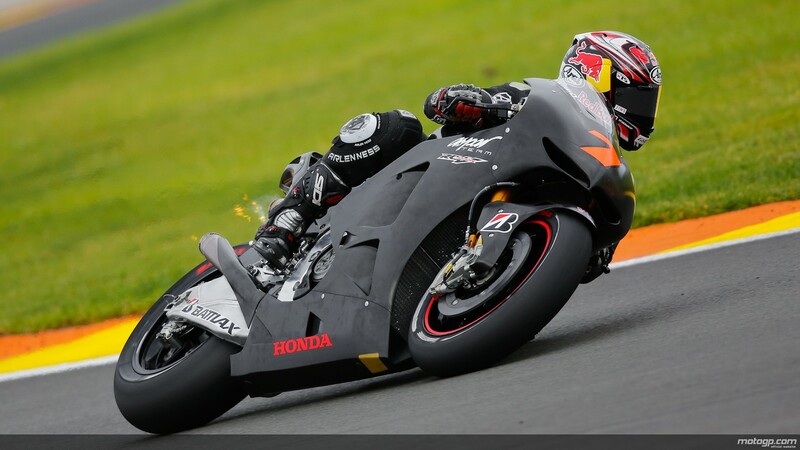 Nicky Hayden on the RCV1000R production racer testing at Valencia. Yamaha will also supply “Open Class” machinery to the NGM Forward Racing Team for both Colin Edwards and Aleix Espargaro. This is the first time since the early 1990’s that Yamaha has offered competitive machinery for sale to private teams in MotoGP. At that time Yamaha supplied complete engines and technical information to specialist chassis manufacturers Harris and ROC. For the new “Open Class” Yamaha is supplying the MI engine, frame and swingarm. Not to be left out, Ducati will also supply a complete “Open Class “ machine to the Pramac Ducati Team. Aleix Espargro on the Yamaha production racer at the Valencia test. All of these production racers will have the benefit of 12 engines per season as opposed to 5 for the full factory prototypes and four litres more fuel, 24 compared to 20 for 2014, and there is also a greater choice of tyres for the riders as well. All of these machines will use the officially supplied MotoGP ECU and software. The other major event at Valencia was the “sacking” by Valentino Rossi of long-serving Crew Chief Jeremy Burgess. The announcement was made at a press conference held on the Thursday before the Valencia MotoGP at the Circuit Ricardo Tormo. 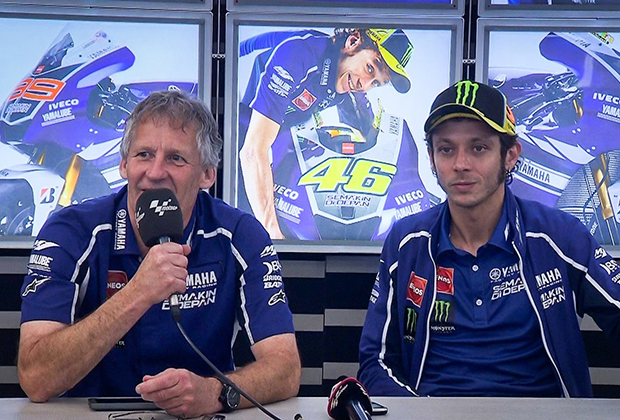 Valentino Rossi’ Crew Chief, Jeremy Burgess, talks about their parting of ways. “It was my decision because we had already spoken with the team about next year,” explained Rossi. “Jeremy said that he wanted to stay. [But] Jeremy had some question marks for the future [beyond 2014], and he didn’t say ‘yes’ or ‘no’, just that he wanted to wait for next year [to decide]. “I also want to wait until next year, and I will decide after the first races if I want to continue. So it was more my decision and yesterday we spoke together to explain that I needed to make a change and try something different. It’s a new boost to get more motivation, so we decided to do this. “The level now has raised a lot with the top three riders, and they are able to ride these bikes very fast and the lap time has improved a lot. It’s a great challenge for me and for us, and we know that it is difficult, but I don’t have any regrets or problems with how the team has worked and especially with Jeremy. “I haven’t made any plans for the future at this stage. My intention originally was to continue next year and depending on results and desire I would make a call. We’ve been chasing rainbows for four years and haven’t nailed anything decent, and these are long periods in racing, and it becomes more difficult [to win]. “I’ve read many sports biographies, and quite often the top sportsman in the latter part of his career will have a change of caddy or a change of coach, and this is what we’re working on. We worked on fixing the problem for four years, and this is part of that fix, and this is the next step to try and get Valentino back on top. During their 14 seasons together Rossi and Burgess have won a record 80 Grand Prix races, using 500cc Honda, 990cc Honda, 990cc Yamaha, 800cc Yamaha and 1000cc Yamaha machinery. As a Crew Chief Burgess has won 13 MotoGP World Championships, 1 with Wayne Gardner, 5 with Mick Doohan, and 7 with Valentino Rossi since starting his career as a mechanic in the 500cc Grand Prix class with Heron Suzuki in 1980. Indeed the end of an era. This entry was posted in Motorcycle Racing and tagged Grand Prix motorcycle racing, Honda, Jeremy Burgess, Marc Márquez, Valencia, Valentino Rossi, Yamaha on 14/11/2013 by Geoff Dawes.